For grandeur, size, and the feeling that you’re Indiana Jones, it’s hard to compete with the temples of Bagan in central Myanmar. This massive expanse of thousands of temples (estimates range from 2,000 to over 4,000) dot the landscape in various stages of dilapidation and restoration. Built by a series of kings between 1057 and 1287, Bagan is one of an increasingly rare breed: a world-class attraction that hasn’t yet been discovered by the masses. Bagan’s popularity is increasing, but much of the information about it has not kept pace, and that can make it difficult for travelers trying to plan a trip to this site. This guide will walk you through each step you need to take to plan and carry out a trip to Bagan, from when to visit and how to get there to which temples to visit and what form of transportation to use. The logistics of visiting Bagan can be somewhat challenging, so it’s important to make sure you throughly understand what to expect before heading out. One of the first things to decide on when planning your trip to Bagan is figuring out when you’d like to visit. The most popular time to visit Bagan is in the winter, from November through February, when it is both cooler and dry. The average temperature during this period is around 80 degrees Fahrenheit (27 Celsius). This is when temperatures are coolest and there is little rain, but this is also when Bagan is most crowded. If you’d like to avoid the crowds or can’t make it to Bagan in the winter, it’s also possible to visit during other times of the year. The end of the dry season, from March to May, is when temperatures are hottest in Bagan. The average temperature during these months is about 95 degrees Fahrenheit (35 Celsius), although the temperature can often get over 100 degrees Fahrenheit (38 Celsius) in the middle of the day. Rainy season begins at the end of May and lasts through October. Temperatures are cooler during this period (about 78 degrees Fahrenheit/ 26 Celsius), but it will rain nearly every day. Take your personal preferences into account when choosing when to visit. Winter has the most enjoyable weather, but you’ll also have to deal with more crowds (although nothing close to those you’ll find at similar locations like Angkor Wat). If you think you can handle the high temperatures, the end of the dry season can be an ideal time to visit Bagan as you’ll have many of the smaller temples to yourself. The short period between seasons can also get you the best of both worlds. I visited Bagan at the end of May, right at the beginning of the rainy season, and I was lucky to have no rain, cloudy skies which kept the temperature lower, and few other visitors at the temples, although this won’t always be the case. Whatever month you choose to visit Bagan, know that any time in the near future is a great time to go. Bagan’s popularity has been steadily increasing in the past few years, and, while it’s still a somewhat undiscovered place, that won’t last forever. So visit Bagan now before the rest of the world catches on. The temples cover a huge area and take a while to get to, therefore I’d recommend spending at least two days, ideally three, in Bagan. Your first day can be spent visiting the major temples (described below), preferably with a guide, on your second day you can explore some of the smaller and more distant temples on your own, and your third day can be spent further exploring the area or returning to some of your favorite temples. Staying longer is always possible, and you could easily spend your entire trip exploring Bagan and still only see a fraction of what it has to offer. However, there isn’t much else in the area besides temples, so if you get easily “templed-out”, take that into account when planning your itinerary. Most foreign visitors to Myanmar will require a visa to enter the country. If you’re a citizen of Brunei, Cambodia, Indonesia, Laos, the Philippines, Thailand (only if you’re entering via an international airport), or Vietnam, you don’t need a visa if your visit is less than 14 days. Most people who need a visa are eligible to apply for an eVisa (check the website to see if your country is one of those eligible for the eVisa). To apply for the eVisa, you’ll need your passport information, a recent color photo you can upload, and credit card details to pay the $50 fee. After your eVisa is approved, you’ll receive an eVisa approval letter which is valid for 90 days and which you must have with you when you arrive in Myanmar. If your approval letter is expired, you won’t be allowed to enter the country. Your eVisa allows you a single visit of up to 28 days in Myanmar, and eVisas can only be used by people entering via an international airport. Most people enter Myanmar at the country’s largest city, Yangon, but there are also two additional international airports in Mandalay and Nay Pyi Taw. The eVisa is by far the most popular way to get the visa needed to enter Myanmar, but there is also a paper visa and a visa on arrival. For people in the United States, information on the paper visa, as well as the form you need to fill out and submit, can be found on the Myanmar Embassy’s website. The paper visa will also grant you a single visit of up to 28 days, and you’ll need to attach proof of your plane tickets, hotel reservations, or confirmation from your tour leader. Visas on arrival are rare to get, and they also require additional documents, such as proof of your itinerary. More information about them can be found on the government of Myanmar’s website. The kyat is the currency used in Myanmar, and one USD is worth approximately 1175 kyats. You can get kyats at an ATM or by exchanging money at a bank or exchange center. If you are exchanging US dollars, make sure the bills are in as pristine condition as possible, as many places won’t take them if they have any wrinkles or tears. It’s best to get kyats before you arrive in Bagan, as ATMs and official exchange centers are rare outside of the main cities. Some places will accept US dollars in place of kyats, and many of the larger hotels accept major credit cards. After you arrive in Myanmar, there are several ways to get to Bagan. If you’re traveling with a tour, these details will already be worked out for you, but if you’re traveling independently, you’ll have to figure out how to get to Bagan on your own. Flying domestically in Myanmar used to be difficult because there was no way to purchase tickets online. Recently, however, most airlines have adopted e-ticketing. Flights are still limited, so tickets should be purchased at least several weeks, and ideally a few months, in advance. The airlines offering flights to Bagan are Asian Wings Airways, Golden Myanmar Airlines, Mann Yadanarpon Airlines, and Myanmar National Airlines. Roundtrip flights from Yangon start at about $215, and from Mandalay at about $150. The cheapest way to get to Bagan is traveling by bus. Overnight buses from Yangon leave around 6pm-8pm and arrive very early in the morning, usually around 3am. (Hotels are well accustomed to this, and many will let you check in when you arrive, provided your room is vacant.) Bus rides from Mandalay take five to seven hours and travel during the day. There’s variation in the quality of different bus lines, with the higher-end companies, like JJ Express or Bagan Minn Thar Express, offering reclining and quite spacious seats. Most hotels can help you purchase bus tickets, or you can buy them from the ticket office directly. Tickets from Mandalay cost about 10,000 kyats ($9), and tickets from Yangon start at about 15,000 kyats ($13), with higher-end companies costing a bit more. Traveling by train is slower than more expensive than going via bus, but if you enjoy train journeys, you may be interested in taking a train to Bagan. From Yangon, trains leave around 4pm and arrive the next morning at about 10am. Trains from Mandalay run during the day and take about 7 hours, although delays of up to several hours are often reported. Trains in Myanmar are often old and have only basic amenities, although most will have a restaurant car available. Train tickets need to be bought at the station. A ticket for a sleeper-car from Yangon will cost about $50, while tickets from Mandalay are about $7-$10. The only way to enter Bagan via boat is if you’re coming from Mandalay. The journey can take between 8 hours and two days, depending on whether you’re on a government-run “slow boat” or a faster boat that makes fewer stops and doesn’t overnight. Boats stop in either Nyang U or Old Bagan. The ferry service is shut down from April through June due to low water levels. Ticket prices can vary widely depending on which boat you take, but prices are generally between $15 and $40. Once you arrive in Bagan you’ve made it through the hard part, but there are still some decisions to be made. Both the Nyuang U Airport and the train station are located 2-4 miles southeast of town, depending on which part you’re going to. The jetty is about half a mile from Nyuang U market (the boat may also stop in Old Bagan), and buses will drop you off along Nyuang U’s main road, a few miles from town. No matter how or when you arrive, there will be transportation options to get you to your accommodation. However, if you arrive very early on an overnight bus, your options may be limited to tuk-tuks as opposed to taxis. When you arrive in Bagan, you’ll have to pay the Bagan Archaeological Zone fee (25,000 kyats or $20). If you arrive via boat or plane, you’ll pay this fee at the port or airport. If you arrive by bus or train, there are checkpoints where your driver will stop and you’ll pay the fee (these checkpoints are manned around the clock, so even if you arrive at 3am, you’ll still have to pay). After you pay the fee, you’ll be issued a small card you may be asked to show your hotel when you check in. The card is valid for one week, but people working at the temples rarely ask for it, so you likely won’t have to buy another card if you stay longer than a week. While not very populous, Bagan covers a significant area (the Bagan Archaeological Zone on its own is 26 square miles), and there are several different towns you can stay in. Be aware that hotel prices drop significantly during the off-season if you look for deals online. Most people stay in Nyuang U because it is the largest town in the area and offers the most amenities. Nyuang U is also where most of the transportation links are, and, even if you don’t stay here, you’ll likely pass through on your way in or out of Bagan. If you’re traveling on a budget, Nyuang U has the widest selection of hostels and budget hotels in the area, with some rooms as cheap as $20 a night. It also has the greatest selection of restaurants. Nyuang U has a few minor temples within its boundaries, but it’s two miles away from the edge of the main temple area. Old Bagan is located next to the Irrawaddy River, just a short walk to the main temple zone (however, a bike or other form of transportation is recommended to reach more distant temples). Because this is the closest you can stay to the temples, accommodation is most expensive here. There are some high-end hotels that cost several hundred dollars a night, but it is possible to find a room for under $100 or even less if you visit in the off-season. There are restaurants here but, in general, Old Bagan is the quietest area to stay in. New Bagan strikes a good balance between the other two areas. It’s between Old Bagan and Nyuang U in terms of both price and distance to the temples, so if you’re trying to balance your budget and travel time to the temples, New Bagan might be a good option for you. One of the most unique and memorable aspects of Bagan is wandering through a maze of hundreds of small and forgotten temples with no one else in sight. At least part of your trip should involve just heading out and seeing what you find, but there are also certain temples everyone who visits Bagan should see, and I’ve described each of them below. These temples are generally the biggest, most beautiful, and most religiously significant in all of Bagan. One of the most important of several thousand temples of Bagan, the Ananda Temple is definitely a must-see. It was built over 900 years ago by King Kyanzittha and today is an important Buddhist pilgrimage spot. Ananda is also one of the best-preserved temples in Bagan, and beyond the entrance are numerous Buddha statues and a courtyard with traditional glazed tiles. This is one of the most popular temples to visit, so there will often be crowds and vendors selling goods during peak times. Dhammayangyi draws visitors because it’s the largest temple in Bagan and is visible across most of the temple zone. It’s imposing exterior matches a grim history. Dhammayangyi is said to have been built in the 12th century as an attempt at atonement by King Narathu, who was known for murdering multiple members of his family. It doesn’t seem to have changed his personality much though, for the king also allegedly chopped off an arm of any worker who didn’t meet his strict construction standards for Dhammayangyi. Gory history aside, this is one of the best-preserved temples in Bagan and has many original paintings and mortar decorations. Also known as the “temple of forgiveness”, Gawdawpalin was built in the 12th century by King Narapatisithu. Legend has it that the king committed a terrible crime that caused him to go blind. After completing the temple and praying for forgiveness, his sight was miraculously restored. This isn’t the most unique or interesting temple to see, but it’s an excellent example of how temples were built in the late Bagan period. This white-washed colored pagoda isn’t the most stunning building in the area, but it’s one of the most popular places to watch sunrise and sunset. Climbing to the highest level gives sweeping views of the plains dotted with temples. At dawn and dusk Shwesandaw can be extremely crowded, but it’s quite empty during other times, and the views are still some of the best you’ll get anywhere in Bagan. Located in Nyuang U, glittery, golden Shwezigon makes a nice contrast to all of the brick you’ve likely been seeing in Old Bagan. The temple includes four shrines, each housing a bronze buddha, as well as 37 nat, or pre-Buddhist religious figurines. The tallest temple in Bagan, Thatbyinnyu is located near the Ananda Temple. The temple is primarily white, with its spires tipped with gold. Unfortunately, past earthquakes have made the upper stories of the building unstable, so visitors are not allowed to climb it. It’s possible to either wander Bagan on your own or hire a guide for a day or half-day tour. There are several types of guided tours. A guided horse cart tour is the most traditional and cheapest way to tour Bagan. Your guide will be a local, and you’ll sit in the back of a cart with a cover on top so you’re protected from sun and rain. Your driver will know where all of the main temples are as well as places to stop for snacks and drinks, but their job is mostly transporting you from one place to another as opposed to explaining the sites. Once you hop out of the cart to explore the temples you’ll be on your own. Prices can vary widely depending on the season and competition, but expect to pay around 25,000 kyats ($21) for a full-day tour and slightly less for a half-day tour. There are also sometimes rickshaws available for tours, but they’re much less common. You can also tour Bagan in a taxi. This will be similar to the horse cart tour, but with increased comfort and cost, and you’ll likely get to see more of Bagan because you can travel faster. Most hotels will be able to hire taxis for you, and you can also enquire at Nyaung U airport. Taxi tour prices can vary widely (always confirm the price with the driver before you start), but expect to pay about twice as much as a horse cart tour. For those looking for a once-in-a-lifetime experience (besides just visiting Bagan itself), it’s possible to take a hot air balloon over the temples. You’ll take off early in the morning so you can see sunrise from the air, then circle around the main temples of Bagan. Balloon tours are only available from October to April and cost about $350-$400 per person. The price typically includes pickup and drop-off, breakfast, and a champagne toast. 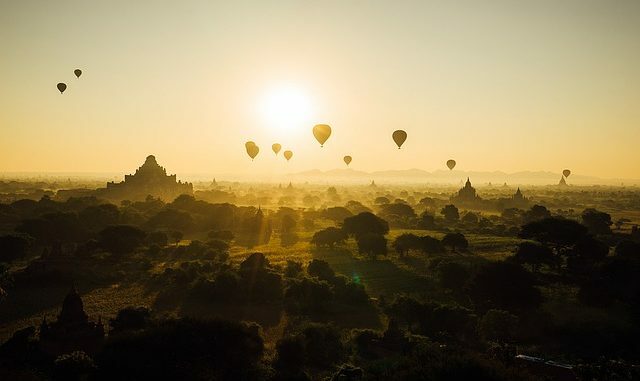 There are several companies that offer these tours including Balloons Over Bagan, Bagan Balloon, Oriental Ballooning, and Golden Eagle Ballooning. Book your tickets before you arrive as the trips can sell out in advance. It’s also possible to explore Bagan individually. Walking is, of course, possible, and can be useful for nearby temples, but Bagan’s size and regular high temperatures mean you’ll probably want to have some form of transportation to more comfortably reach distant sites. Almost every hotel rents bikes for as little as $2 a day. Bikes are a cheap and easy way to get around, but if it’s very hot you may wear yourself out pedaling all day. Also, the ground can get very loose and sandy around the smaller temples, which can be difficult to pedal through. When renting a bike, always try it out first before paying for it. Bike quality can vary widely, and you don’t want to get stuck with a wobbly frame or a flat tire. Another option is getting around on an electronic bike or e-bike, which is a bike that runs on electric power or can be pedaled. These are more expensive, but you travel faster and don’t have to pedal very much. If your own hotel isn’t renting e-bikes, they’ll be able to direct you to a place that does. Again, test the e-bike out before you pay for it, and make sure it’s fully charged. Should You Get a Guide? There are several options for guided tours in Bagan, but do you even need one? As I mentioned above, most tours, excluding some higher-end ones, won’t give you much information about the Bagan temples themselves; instead, they’re primarily a way to get around. This may make you think that a tour isn’t very useful. However, Bagan is a huge site with just a few signs pointing the way to the most important temples. Many temples are found on winding, unmarked dirt roads making it almost impossible to easily find all the temples you want to see on your own, even if you have a map. While in Bagan, I met multiple tourists who had decided not to hire a guide to keep costs down, but many left Bagan disappointed because they were unable to find some of the most important and popular temples on their own. I’d highly recommend hiring a guide for your first day in Bagan and asking them to take you to each of the main temples. This way you’ll ensure that you see each of Bagan’s main sights. You can spend the following day/days exploring the other temples on your own and perhaps return to some of your favorites. Finally, there are a few tips you should keep in mind in order to keep your trip to Bagan as smooth and enjoyable as possible. Bagan is hot all year round, so take advantage of the morning hours right after dawn when Bagan is cooler and less crowded. During sunrise, there will generally be crowds around popular spots like Shwesandaw Pagoda, but at least one morning you should get off the beaten trail and visit some of the lesser-known temples. You’ll likely have them all to yourself. Most of Myanmar is devoutly Buddhist, and the temples of Bagan are some of their most important religious sites. As such, visitors are expected to be respectful and dress appropriately. Everyone, especially women, should make sure their pants/skirt/dress reaches past their knees, and covering your shoulders is a good idea too. Those who don’t meet the dress code will be denied entry into the larger temples (most smaller temples have no one to check what you’re wearing). You must be barefoot when entering the temples, so wear flip-flops or sandals so you’re not spending a lot of time messing with socks and shoelaces. Walking barefoot on hot tiles can get uncomfortable in the middle of the day, which is another reason to get up early. Again, the Bagan temples are culturally and religiously significant to the people of Myanmar, so don’t treat them like they’re just an Instagram background. In February 2016, the Myanmar government banned the climbing of all but five of the Bagan temples. The five temples exempt from the ban are Shwesandaw (discussed above), Pyathard Gyi, North Gunni, South Gunni and Thitsaw Wati. This ban was instituted because of “inappropriate activity” by tourists, including sleeping in the temples, entering restricted areas, dancing in the temples, and causing damage to the stonework. You don’t need to be frozen and silent when you’re in the temples, but don’t be rowdy either and don’t try to access restricted areas (many of these are unstable due to age and earthquake damage, and building collapses are not uncommon). My last and most important piece of advice is to do some old-school exploring of Bagan. Bagan is one of the only archaeological wonders of the world where you’re pretty much given free reign around the site. There are literally thousands of temples to explore, but most tour groups will only visit a handful of the biggest and most famous ones. Grab a bike and just pedal in the direction of anything that looks interesting. I spent several days getting lost in mazes of hundreds of smaller temples, and, in addition to the temples, I came across local goat herders and their flocks, Burmese children walking home from school, and a tiny cemetery a villager brought me to. If you’re worried about not knowing how to find your way back to civilization, bring a map with you. You’ll regularly come across Burmese people, and even if they don’t speak English, if you point to town on your map, they’ll be able to send you in the right direction. Recently, I’ve seen more and more people complaining about crowds in Bagan, but on my recent trip I found it easy to escape the masses by stepping onto any of the smaller dirt roads and seeing where it took me.